The Dodge Challenger SRT8 392 is back again this year, and this time it’s getting even more advanced technologies to go with that monstrous 6.4-liter HEMI V-8 engine. It’s easy to forget about all of the features of the rear-wheel drive muscle car when you have 470 HP and 470 lb-ft of torque coursing through your ride, but Chrysler is revamping the SRT8 392 so that customers will still get 23 mpg, along with a revised suspension system and shift controls from the Charger SRT8. The new two-mode adaptive damping suspension system offers selectable suspension tuning with choices for "Auto" and "Sport" styles. Each option will automatically adapt to road and driver inputs for optimal vehicle control, while the performance SRT-tuned, fully-hydraulic steering system gives drivers more direct response and on-center feel. The 2012 Challenger SRT8 392 also welcomes a new, exclusive SRT heated steering wheel with mounted paddle shifters and a new 18-speaker Harman Kardon audio system with innovative GreenEdge technology. UPDATE 08/01/2011: The Smoking Tire’s, Matt Farah, spent some time frying the tires off a blue Dodge Challenger SRT8 392 with white stripes! Check out the burnout after the jump! 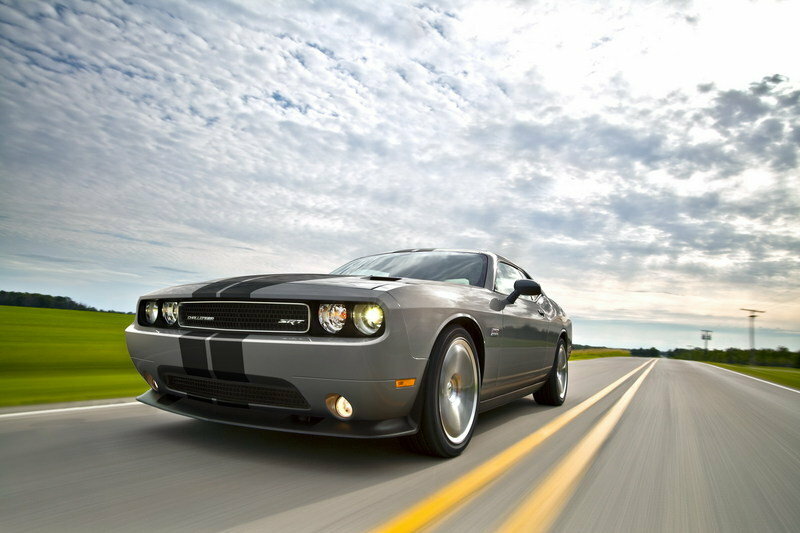 Hit the jump to read more about the Dodge Challenger SRT8 392. As with any other Challenger model, the 2012 SRT8 392 will be immediately recognized as a Dodge model because of its large front splitter, integrated front fender spats, and body color rear decklid spoiler. 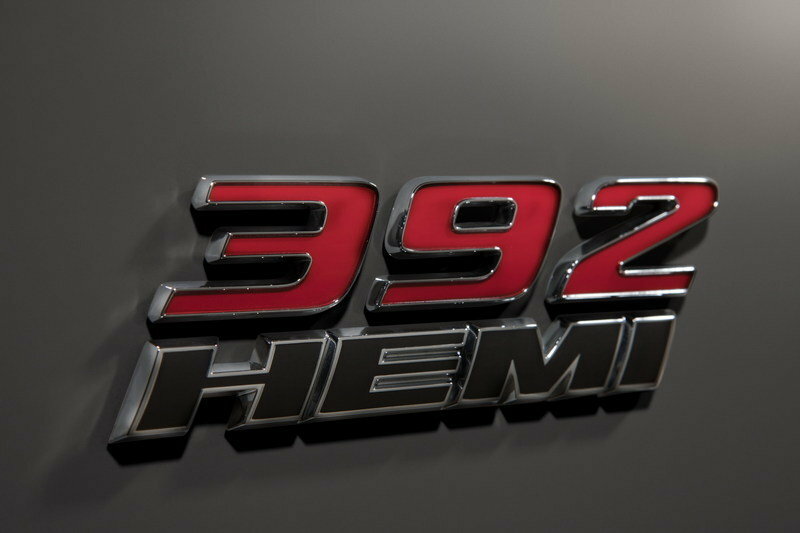 The model will also be distinguished by unique "392 Hemi" badges as a tribute to the engine found under the hood. For 2012, customers will have to choose between a variety of colors, including Bright Silver, Bright White, Header Orange, Pitch Black, Redline Red, and Tungsten Metallic. Dual, full-body stripes are also available in black, gray metallic, red, and silver metallic. Even though the Challenger SRT8 392 is a road going model, the interior was directly inspired from that of a high performance racing car. The new, leather wrapped, heated, SRT-exclusive steering wheel features a unique satin chrome rim section with a flattened bottom surface, while the optional automatic transmission includes paddle shift controls on both sides of the new contoured palm rests so road and track shifting is right at your fingertips. An SRT-exclusive Electronic Vehicle Information Center (EVIC) is also available to provide the driver with information about his 0-60 mph time, 60-0 mph braking, G-forces, one-eighth mile, and quarter-mile times. Power lumbar-equipped front seats come standard with the Challenger with the driver’s seat getting seatback tilt with memory and an easy to reach release handle. The front-passenger seat adds tilt and slide with memory. Color combinations for the interior include last year’s Dark Slate Gray and, new for 2012, Radar Red/Dark Slate Gray. 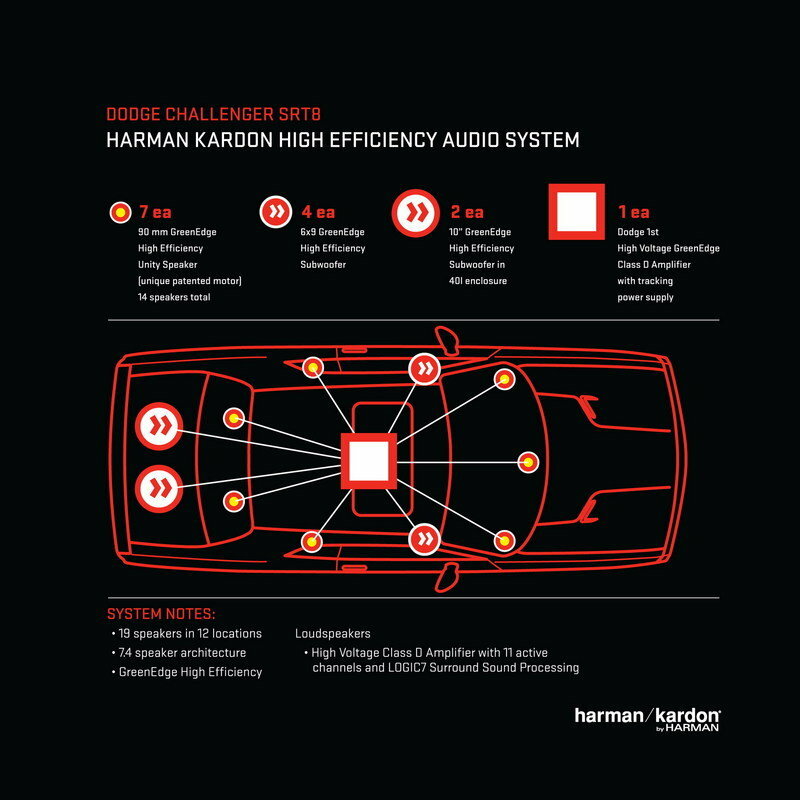 The 2012 Dodge Challenger SRT8 392 also gets an upgrade in the technology department with a new 900-watt, 18-speaker Harman Kardon audio system. This new audio system offers a 32-volt TPS (Tracking Power Supply) 12-channel Class D amplifier, along with GreenEdge speaker and amplifier technology. This new technology offers superior sound quality and high Sound Pressure Level outputs with minimum energy consumption. Apparently the GreenEdge amplifiers alone outperform traditional amplifiers by up to 55 percent. The 2012 Dodge Challenger SRT8 392 also brings back the Uconnect Media Center 430, 430N, and 730N radios from last year’s model. These radios feature a 6.5-inch touchscreen display and a hard drive (good for more than 150 hours of music and photos). With the Uconnect Media Center radios, customers can choose between two navigation options: Garmin Navigation guidance and mapping (Uconnect Media Center 430N), or premium GPS Navigation with SIRIUS Traffic (Uconnect Media Center 730N). 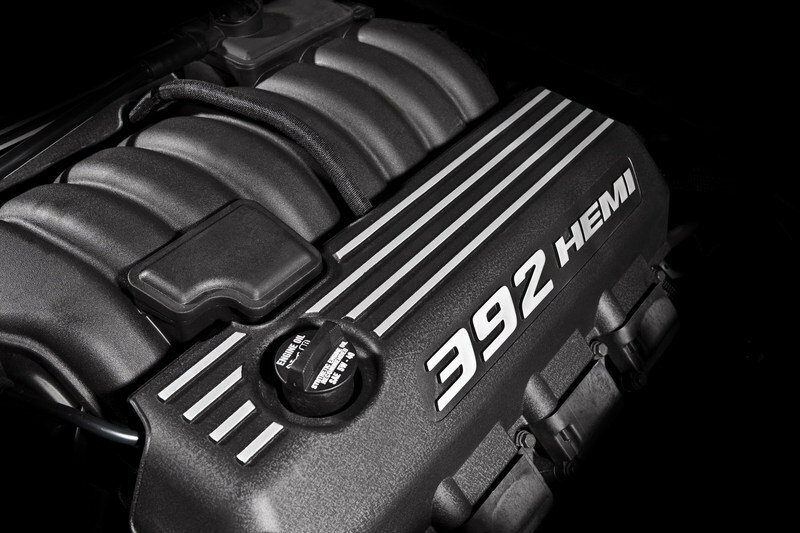 Under the hood of the Challenger SRT8 392, Dodge has placed the legendary 6.4-liter HEMI V-8 that delivers 470 HP and 470 lb.-ft. of torque. 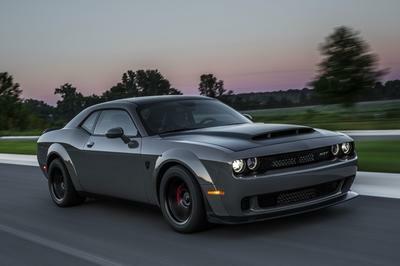 Despite these impressive performance numbers, the SRT8 392 delivers up to 23 miles per gallon on the highway with the standard Tremec TR-6060 six-speed manual transmission and a dual-disc high performance clutch. A five-speed automatic transmission is optional and provides the driver with a choice of four driving modes: "Drive", "Normal", "Sport" and "Manual". "Drive" allows the transmission controller to automatically shift the vehicle, "Normal" and "Sport" control the aggressiveness of the shifting, and "Manual" gives the driver the option to use either the paddle shift or the Auto Stick. The “Sport” mode also adds a hold function to the calibration in all gears, allowing the driver full control of the shifting schedule. The performance numbers for the 2012 Challenger SRT8 392 are still top notch with a 0-60 mph time in the high 4-second range, a quarter mile time in the mid-12-second range with the automatic transmission (high 12-second range with the manual), and a 0-100-0 mph time in the low 15s. 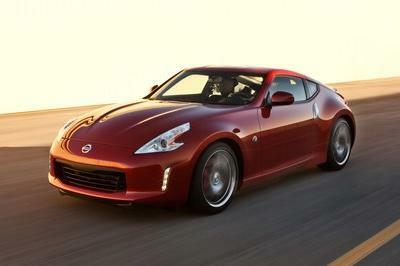 Top speed goes up to 182 mph with the manual transmission and 175 mph with the automatic. A high performance HEMI V8 needs high performance brakes, so Dodge has opted for the standard SRT performance brake package which includes 13.8 inch (rear) vented/slotted rotors with four-piston Brembo fixed calipers painted red. The three-mode electronic stability control system with knockback mitigation also includes four-wheel ABS, all-speed traction control, electronic brake-force distribution, Brake Assist and Hill-start Assist (HSA). These features allow the Challenger to get from 60-0 mph in just 117 feet. The Dodge Challenger also features a Ready Alert Braking system that can anticipate when the driver quickly releases the accelerator pedal. The system can then initiate an emergency brake stop, after which the electronic stability control pump engages to set brake pads against rotors in order to decrease the time required for full brake application. The 2012 Dodge Challenger SRT8 392 will go on sale with a starting of $44,077 (price does not include a $1,300 gas guzzler tax on the automatic transmission and $1,000 for the six-speed manual). 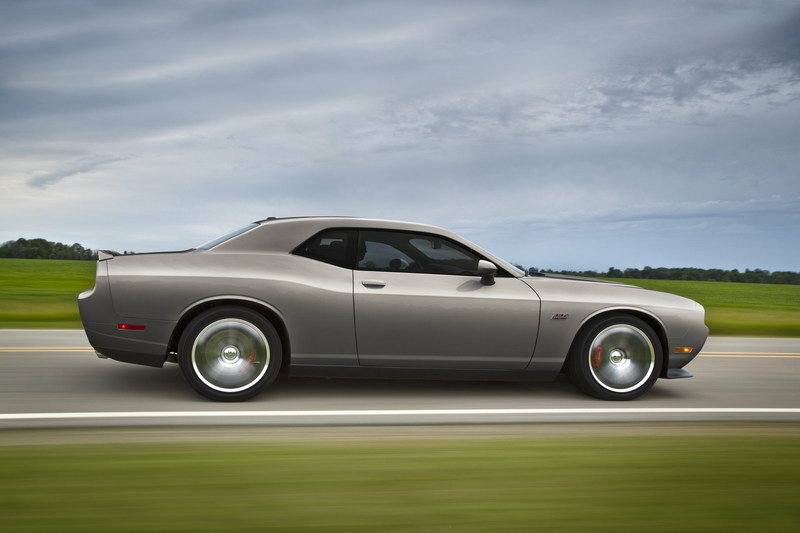 With the significant improvements the Challenger has received, the 2012 SRT8 392 will still face models like the Chevrolet Camaro SS and the Ford Mustang GT. 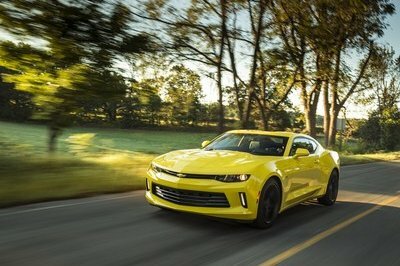 Both the Camaro and the Mustang have the advantage of being cheaper, but they also both deliver less horsepower than the SRT8 392 (412 HP for the Mustang GT and 426 HP for the Camaro SS). Slightly impressed with this car. It looks like aggressive in its parallel lining, it add up strong appearance on a black scheme. Guess it has powerful automotive engine. Yeah! They can’t be together! They are rivals. If there is no competition, no more awesome cars will be built. They will not put an effort on every car because they don’t have competitors if ever. What are you talking about? 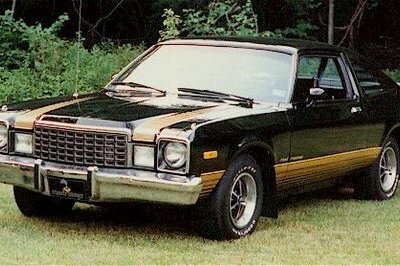 Ford and Chevy can’t be in the same project together for they have been a long time rival in muscle car production. BTW, I like more the new version and power output of this vehicle! I’m glad to hear that the most loved because of its awesome look and styling is back! I think everyone is happy to see a newer version of SRT8 392. The smokey burnout of the car is really aggressive! I definitely agree with all your comments. This is a big project of Ford and Chevy. I’m hoping that they will still do projects together, since they have this wonderful partnership. The car is simply cool and has an astonishing performance. By the way, it’s a good thing that Chevrolet and Mustang combine in this project. This could be the comeback of Mustang in the world of cars. the most favored man ever. haha! As expected the Chevy and Ford have something to offer in response to this vehicle. 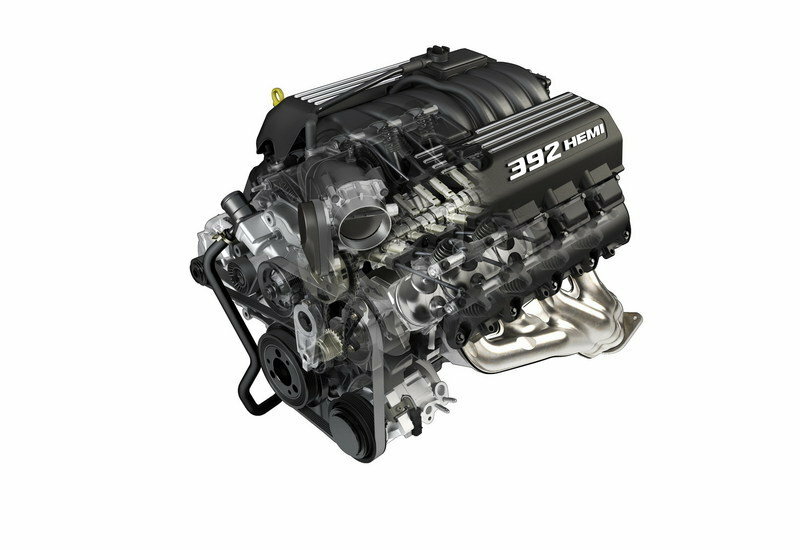 Comparing the power output of the three, the horsepower of the SRT8 is quite good. I really love the aggressiveness of the SRT8. The modification on its exterior is quite impressive! I bet the new steering wheel system will makes the car to have a smooth ride. BTW, the upgraded engine perform impressively as well.